Just one day after teeing off on the No. 1 overall pick in the 2018 MLB Draft, the bats of No. 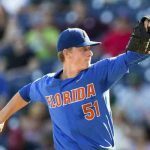 1 Florida Gators baseball went ice cold against a pair of freshman pitchers from the Auburn Tigers who held pace with another first-round pick taking the mound for the hosts. Auburn edged Florida 3-2 on Sunday afternoon, tying the 2018 Gainesville Super Regional at 1-1 and forcing a Game 3 to be played on Monday. Florida and Auburn answered each other constantly when runs were scored on Sunday. After the Gators plated one in the top of the fourth, the Tigers responded with a solo homer in the bottom half of the inning. When AU batted around to take a 2-1 lead in the bottom of the eighth, UF bounced back with a solo shot to tie the game 2-2 in the next frame, attempting to force the contest to extra innings. Instead, Auburn worked Florida freshman right-handed pitcher Jordan Butler into a leadoff walk to open the bottom of the ninth, and head coach Kevin O’Sullivan soon pulled him for junior RHP Michael Byrne, the team’s closer. Byrne (0.1 IP, 2 H, K) was unable to deliver the clean sheet the Gators needed, giving up two hits to the three batters he faced with Butler (1.0 IP, 2 H, 2 ER, BB, 2 K) responsible for the game-winning run. Florida wasted a tremendous outing from junior RHP Jackson Kowar (7.0 IP, 3 H, ER, 6 K), and it is fair to wonder if O’Sullivan should have left his No. 2 pitcher in for one more inning considering how well he was tossing the ball upon his exit. 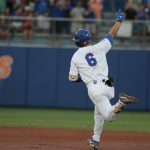 The Gators’ offense was simply unable to muster any form of a rally, going 0-for-8 with runners in scoring position to strand five on base over the course of the contest. Florida and Auburn will meet once more on Monday night at 8:30 p.m. ET for Game 3 of the Gainesville Super Regional with freshman RHP Jack Leftwich (4-5, 4.50 ERA) expected to get the start for UF. The Tigers have never won a Super Regional, while the defending champion Gators are hoping to advance to the College World Series for the fourth straight season and seventh time in the last nine years under O’Sullivan.